Traditional PBX Phone Systems view each extension as an actual physical phone at a specific location within the office. Incoming calls are forwarded to the physical desk where that phone resides. With Unlimited Voicemail Plan, it acts as a Virtual PBX system with no physical limitations and connects extensions to actual people no matter where those people choose to have calls routed to. For the caller this goes unnoticed, as the caller is simply dialing the main company phone number and choosing the appropriate extension. Unlimited Voicemail Plan then routes the call to the appropriate person for that extension at the locations of his choosing no matter where that may be! Live Call Forwarding will forward calls to up to 5 different phone numbers in a specific order of your preference. These calls can ring directly to your forwarded number or Unlimited Voicemail Plan can announce the name of the caller and let you choose to accept the call, transfer the caller to voicemail or record a message to be played to them prior to sending them to your voicemail. Once you accept the call, you can forward the caller to another extension or even another phone number altogether (see Live Call Transfer). This creates the impression of a single office even if you and your employees work from different geographical locations. This feature is available for the Main Greeting, Message Taking Mailbox Extensions, Greeting Only Mailbox Extensions and Virtual PBX Extensions. Each of these extensions can be set to forward to totally different people as well. This is great for connecting all your employees or departments through one central number ! Think about it; even though your physical office is located in North Carolina, your Sales person can be in New York, your customer care person can be in California and so on. To your caller it is as if they are all located in one place sitting next to one another in cubicles. With the Live Call Transfer feature one person can even transfer a caller to another person’s extension. 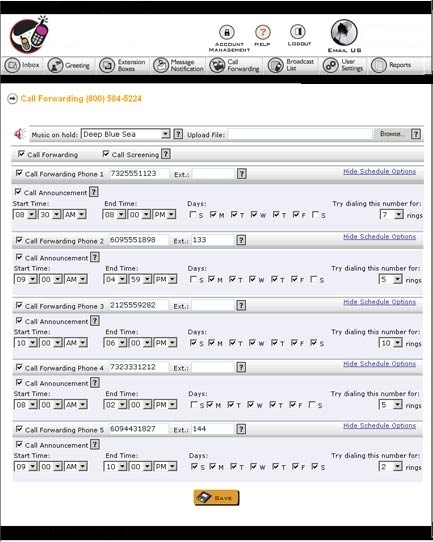 A classic example of how beneficial the Live Call Forwarding feature with multiple number dialing options can be is this; how often have you been waiting on an important phone call and perhaps you suddenly need to leave the office quickly ? Or you just can’t sit around and wait for that call to come in. In either scenario your calls can continue to be connected to you no matter where you go throughout the day. Live Call Forwarding even allows for you to enter a main number and an extension number for calls to be forwarded to! With this functionality you can be staying at a Hotel or visiting another facility with office or room extensions and Unlimited Voicemail Plan is smart enough to dial the number and, when connected, then dial the extension number of your room in order to connect you! Numerous Scheduling Options - You can even configure the days and times of day that you want to be available so you won’t get caught off guard. Being available to your callers is better customer service, and at the same time, you can screen your calls enabling you to send time wasters to voicemail. The scheduling for all of this can be done in real-time through the Web Center online management system. Voicemail Live Call Forwarding. We bring your caller to you, just tell the Telecommunications Center where you will be. If making sure you are available to your existing or potential customers is a concern for you, stop worrying. Our Live Call Forwarding feature will track you down at home, in the office, on a cell phone or any other pre-designated phone number to let you know that someone wants to speak with you. To do this, your caller only needs to have ONE number, your Unlimited Voicemail Plan number. This type of service is known by most phone service providers as Find Me/Follow Me. While callers are on hold listening to music or your personalized message this feature locates you and delivers the call to you.